This collection of robotic healthcare innovations ranges from fixed equipment to prosthetics and concentrates on the ways we’re seeing an exciting mix of solutions that merge the fruits of Silicon Valley with the hospital. There are so many exciting possibilities wrapped up in an invention like the 7-Miles Orthosis. This innovative mechanism is a system of robotic leg braces that supports the human body and provides assistive propulsion. It would prove particularly advantageous for people with some physical disabilities. As part of the Dassault Design Challenge, Josef Ludvik Bohm devised this complex contraption that fastens to the wearer at the hips, the knees, the ankles and the feet. It can be adjusted to suit people of various heights. The 7Miles bears the weight of the user and helps to keep him upright while it steps one foot in front of the other with little to no effort on the part of the person. The 7-Miles Orthosis could help the handicapped walk again and also serve as a swift commuting suit. The FIT adjustable prosthetic is an artificial limb built to grow with its user. Designer Oz Benderman created FIT in order to help child amputees in developing countries save money on prosthetics. Since children are constantly growing, having an adaptable prosthetic means that the user is always using a correctly sized limb. As a result, those that don’t have easy access to medical treatment can maintain mobile. FIT works to grow with a child over multiple years. A notched central rod allows the user to lengthen or shorten the prosthetic as needed. Thus, anybody can easily adjust the prosthetic without professional assistance. Benderman designed FIT to be easily distributable to children with transtibial amputations in developing countries. FIT has the potential to cost less than $10 per unit if mass-produced. The innovative Bio-Cleaner 2 functions almost like an underwater vacuum, sucking up liquid and spitting it out again, in much better quality than how it encountered it. This cutting-edge, serpentine machine has been developed to tidy up the environment beneath the ocean’s surface, aiding particularly in the effort to filter polluted H2O. Hsu Hsiang-Han, Wang Jhih-Jie, Wen Tzu-I and Luo Yih-Wenn developed this amazing android. It draws in water that’s been contaminated with metals, pulls it down its long and meandering body and exposes it to bacteria that break down the hard material. The modular configuration enables you to increase the length of the Bio-Cleaner 2 if the job is much bigger. It would prove quite useful following collisions or submersions of ships. Finding it hard to stick to your fitness goals? Constantly cheating throughout the day on your diet? Autom, the robot fitness coach, is designed with your health in mind. The talking robot fitness coach created by Intuitive Automata was created to talk you through daily diet and exercise routines. Using an LCD touch screen, you can communicate with the robot fitness coach, punching in your daily food schedule and physical activities. Autom is approximately 15 inches tall but the best part about Autom is the fact that no two conversations will ever be alike because the robot fitness coach is connected wirelessly to the Internet! Being in a hospital is hard enough, which is why the ‘Medirobot’ Medical Robotic Assistant is such a welcomed addition to staff. For those suffering from very serious injuries or who simply cannot move around on their own yet, this robot helps transport them around the hospital easily and, hopefully, as pain-free as possible. A woman paralyzed from the waist down has regained the ability to walk, thanks to a robotic exoskeleton. Amanda Boxtel was told she would never walk again after suffering a serious ski accident, but a 3D-printed robotic exoskeleton has helped her walk again. Robotic exoskeletons were once the stuff of movies, giving fictional superheroes superhuman powers. But fiction has now seemingly become reality. Amanda’s implant was made by scanning her body and inputting her attributes into a 3D-printer to create a personalized robotic exoskeleton. This is an example of how technology can make the seemingly impossible possible. On the basis of medical science alone, doctors were right in telling Amanda Boxtel that she’d never walk again. Cutting-edge robotics have made possible what no existing medicines or surgeries can, and that’s encouraging. Personal trainers have good reason to fear the Gymbot Personal Trainer Robot. Massimo Battaglia’s health bot is designed to whip the obese and overweight into shape in the year 2020. The Gymbot is designed to be by your side 24 hours a day and is programmed to correct laziness and poor eating habits. The Gymbot Personal Trainer Robot has a camera and microphone allowing it to communicate with and analyze its client. The bot can check your heart rate and analyze your body fat level to get a more accurate picture of what you need to do to become healthier. Battaglia’s creation is programmed to get you off the couch and even perform some exercises with you. A personal trainer robot could be a great way to help the world get into shape. The robot would probably come with a high price, but that price would buy you a lifetime of training and save you money on medical bills caused by being overweight. This bionic hand may restore a sense of normalcy to a difficult situation. Losing a limb can be one of the toughest experiences a person can have, but a Swiss research team is trying to make rehabbing an easier experience. Tragedy can strike at any time without warning. While losing a limb is a horrible experience there can be a silver lining with this new bionic hand. Bionic appendages help to make things more normal for the wearer. While a regular prosthetic hand can be useful for lifting and carrying things, it doesn’t return the feeling of touch to the user. In order to use the prosthetic hand, the user must have electrodes implanted in their arm. After the electrodes are implanted, the bionic arm is attached and interacts with the electrodes to restore partial feeling to the arm. This concept for Electrolux Germs attempts to accomplish two goals within the domain of domestic sanitation. Firstly, the system proposes an eco-friendly means of operation; secondly, the idea is to not completely sterilize the home, for there is great value to keeping some bacteria alive. To use Joris Bonnesoeur’s invention, you would fill the tray of the square-shaped base with filtered water from the shower in your own bathroom. This resourceful proposal makes it unnecessary to waste fresh water from the tap. The liquid is passed into the little robotic minions, enabling them to offer steam-cleaning capabilities. Their bristled bottoms do the scrubbing on floors, walls and windows, thanks to concealed suction cups. The autonomous Electrolux Germs system maintains communication so to efficiently cover every square inch of the room. The Panasonic hair-washing robot is a natural companion for the Panasonic wheelchair bed, and the makers hope that both will help to care for Japan’s growing elderly population. The sophisticated elder-care system is designed to deliver the user from his or her transformer bed — after it transforms itself into a wheelchair — to the Panasonic hair-washing robot. The robot uses sixteen mechatronic fingers to wash and rinse the patient’s hair. The system also records the biometrics of the head’s shape and keeps track of head massage preferences and other patient information. Schultz won multiple X Games Medals wearing the prosthetic he built himself. The Versa Foot allows amputees to compete on an even level with non-amputees on things like snowmobiles and motorcycles. Schultz used FOX motorcycle parts to create the Versa Foot and the product is one of the most customizable prosthetics out there. It includes adjustable shock absorbers, interchangeable sole plates and four different ankle configurations. The Versa Foot is made to stand up to extreme sports and weather conditions. This new technology may save your eyesight. Bradley Nelson is a professor of robotics and intelligent systems at ETH-Zurich. Leading a team of researchers, he has created tiny devices that will help save your eyesight. These tiny robotic devices are injected into the eye and can be steered through the eye’s fluids with external magnetic fields. Nelson and his team of researchers have done this by coating these micro-robots with nanospheres made out of a special dye that will turn the devices into oxygen detectors. When they are exposed to a specific wavelength of light, the dye glows. A Fluorescence that disappears quickly will then indicate high amounts of oxygen that are surrounding the dye. If the dye fades slowly, this indicates low amounts of oxygen. Essentially the new oxygen-sensing robots will indicate when the blood flow to the eye is restricted, which is generally the result of vision loss. Engineers at Stanford worked to remove another piece of human fallibility from the medical field by creating an automated blood robot called the ‘Veebot.’ The Veebot is a system for completing the entire process of collecting blood from beginning to end. The robot starts by using ultrasound and infrared optics to locate the perfect vein to draw from. After finding the correct position, the catheter is inserted accurately. Finally, the vial of blood is capped and labelled automatically for the doctor to pick up. Each robot was created to be much more accurate than most doctors are. Since over a fifth of all venepunctures performed by humans miss on the first try, the Veebot is performing a valuable service by automating it. When an American soldier is wounded in the process of serving his country, the Pentagon and armed services have a tendency of throwing their full weight behind his recovery, and the Fiber Optic Arm hopes to give the most maimed and impaired veterans a chance at recovery. According to a military-funded team of researchers at the Southern Methodist University, the best chance of giving prosthetics a degree of verisimilitude is with laser beams. A bundle of laser-filled fibers will be the intermediary between the next generation of prosthetic hands and the severed limbs they’ve been attached to. The Fiber Optic Arm can successfully translate the minute nerve impulses the body produces to tell limbs when and how to move, and will deliver those messages to a robotic hand. With tests being conducted as we speak, the next stage will be to send those neural messages back to the brain, so that the arm will be able to detect heat, pain and pressure. Here’s hoping the soldiers who served without question will have the pleasure of fully functional limbs as soon as possible. Dennis Sorensen received a ‘LifeHand 2′ to give him the chance to feel again. Ten years ago he was setting off fireworks on New Year’s Eve in Denmark when the terrible accident happened. Doctors had no choice but to amputate what was left of his hand. Dennis has been using a prosthetic hand since. At the moment, Dennis has no feelings in his hand, but the hope is strong for the LifeHand 2 to provide him the chance to feel again. 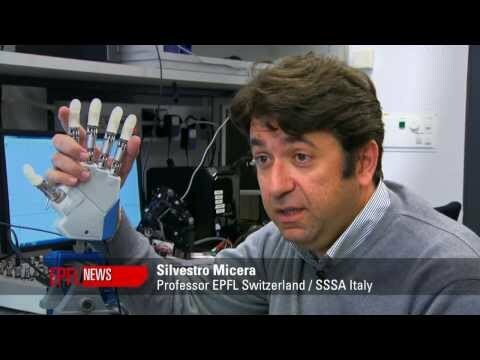 Silvestro Micera is the director of the Translational Neural Engineering Laboratory at the Ecole Polytechnique Federale de Lausanne in Switzerland, he says the project aims “to give back as much as possible natural sensory information.” Sensors have been added to each finger and tiny electrodes in the arm connect to the sensors to nerves. There is still a lot of time before we will know for sure, but so far so good for Dennis. Utilizing the da Vinci Surgical system, John Hopkins University has created a gesture-controlled medical device. The ‘da Vinici’ (a robot-assisted surgical device) can now be gesturally controlled with the wave of a hand thanks to the John Hopkins Computational department’s program. Though this is a hack and still in the testing stages, the idea of less contaminated surgical room gives much hope to future patients and the medical world. As technology advances and technique precision become increasingly accurate, we will begin to see medical devices whose original intent are to be gestured controlled robots that aid in performing tough surgeries and medical repairs. It’s amazing to think of how the health industry will be revolutionized by inventions like this. In an effort to help the disabled live more independently, Toyota has unveiled what it’s calling the Human Support Robot. The Human Support Robot, or HSR for short, is specially designed to help with tasks like picking up fallen objects, fetching items and closing curtains. Its resting height is 2.7 feet tall, but the body is telescopic and can grow to 4.3 feet when needed. the HSR is also outfitted with a single 2.5 foot arm that it uses to grasp and manipulate objects. Commands can be programmed and issued to the HSR via a tablet PC. the HSR can also support a tablet PC as a headpiece to make it seem less emotionless, or to allow caregivers and family members to communicate with the robot’s owner through services like Skype. Although the Human Support Robot was created with the disabled and elderly in mind, it’s easy to see how any lazy person would want to have this little helper around at all times to perform simple tasks — like inserting Cheetos in your mouth while you play Call of Duty. Although Dvice sees the Meal Assistance Robot helping the elderly in the recovering country of Japan, I see it helping not just seniors, but also other disabled individuals around the world. Conceived and created by Isao Wakabayashi, the Meal Assistance Robot is just what it sounds like. 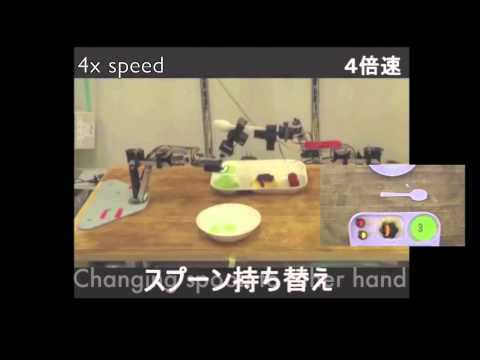 It is a robot that assists people with eating. Considering how the world is often short of caregivers in all forms, this interesting robot may be the perfect solution to fixing this problem. Controlled via voice commands, the Meal Asstance Robot can recognize meal items and serve them to the user. Although a bit slow right now, its potential is truly amazing. 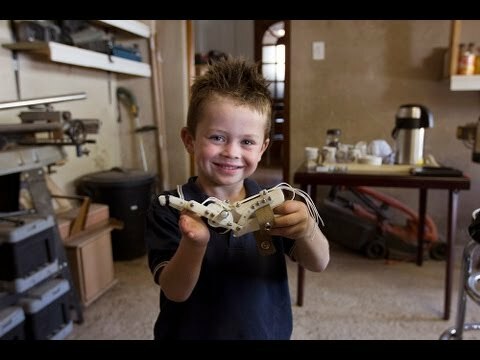 Children’s prosthetics need to be changed every couple of years and since the cost for the Robohand is only $150, this will alleviate the financial burden of families who aren’t able to afford regular prosthetic hands for their children. The project is open sourced, making it more convenient for everyone. The i-limb Ultra Revolution allows users to program different kinds of grip types triggered by different muscle movements. This is made possible by the incorporation of ‘grip chips,’ Bluetooth-enabled devices that can be attached to objects and trigger a pre-programmed grip configuration when detected by the device. For example, a Grip Chip can be attached to a computer keyboard to initiate a grip pattern suitable for typing. The i-limb Ultra Revolution comes with accompanying iOS and Android apps, while the device itself has a conductive surface that enables it to be used with touch-screen devices. Klippa by Kai Lin, a design student based in Brooklyn, New York City, is a prosthetic leg made specifically with rock climbers in mind. For those who have the will and determination of Aron Ralston, who continues to lead an active lifestyle even after cutting his own arm off when literally stuck between a rock and a hard spot (watch ’127 Hours’), this allows disabled individuals to still indulge their passion for the sport. Klippa by Kai Lin was born after much research observing and researching rock climbers. Neatorama writes, “He determined that a climber’s leg needs easily replaceable rubber, an elastic pivot point, and a small contact surface with the rock.” The foot was also inspired by a mountain goat’s hoof. Advances in robotics have infused music into prosthetics for one amputee drummer. The new prosthetic allows him to continue his love of drumming and music. The last thing musicians would fear is losing the ability to make music. This new prosthetic shines a light onto the possibilities that could contribut to musicians of other instruments. As we move forward into the future, we can feel good that amputee musicians’ lives will be filled with the sound of their music. Traditional wheelchairs may increase the mobility of handicapped individuals, but only in basic ways; the Chiba Tech Robotic Wheelchair, however, introduces a whole new range of movement that will increase people’s independence even more. In addition to typical capabilities, this accessible seating will allow users to cope with uneven surfaces and tight spaces. More than that, the wheel function more like legs, which can be operated to climb stairs. 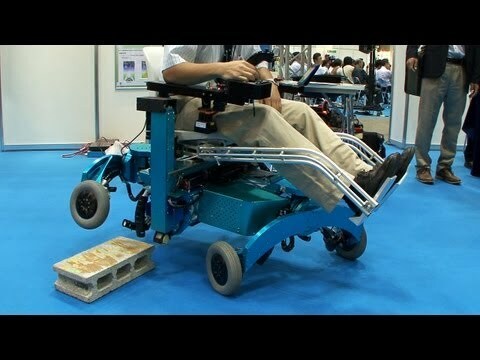 Developed by researchers at the Chiba Institute of Technology, led by Shuro Nakajima, the Chiba Tech Robotic Wheelchair is still in its prototype stage. While it is equipped with a variety of sensors to detect the layout of a room and modify its movements accordingly, these movements still require a bit of finessing. The Robo-Washer is a hand washer and dryer that gives your hands a comprehensive cleansing. The device is a natural step forward from the Dyson Airblade dryer, which struck everyone as an incredibly cool hand-drying solution when it was introduced in 2006. The Robo-Washer delivers 360-degree jets of high-pressure soapy water followed by a blast of drying air to give you an all-inclusive touch-free hand-cleaning experience with no mess or hassle. It’s essentially a car-wash for your hands — users stick their hands in the hole and rub them together as they’re sprayed with soapy water. Users then keep rubbing their hands together as the Robo-Washer shifts to dryer mode. Drippings from the Robo-Washer are discreetly and effectively contained a bucket drain system so there’s no mess or spillage. The developers of this robotic hand washer and dryer are trying to raise $100,000 of funds through the crowdfunding website Kickstarter. This mind-controlled prosthetic arm just got FDA approval. The DEKA arm is the first of its kind to get approval from the FDA. The bionic arm is the result of almost eight years of work from DARPA, the US Defence Department’s advanced research agency, who were looking for a better answer for amputees. Designed by a company founded by Segway inventor Dean Kamen, the mind-controlled prosthetic is roughly the same weight and size as a regular human arm. The fake limb is controlled by electromyogram electrodes placed on the remaining portion of the human arm. The sensors collect information from the upper arm and communicate what kind of movements or manoeuvers the arm wants to do to a computer inside the prosthetic.